This modern and fully furnished apartment is located on the first floor of the comfortable Schier Beach Resort. 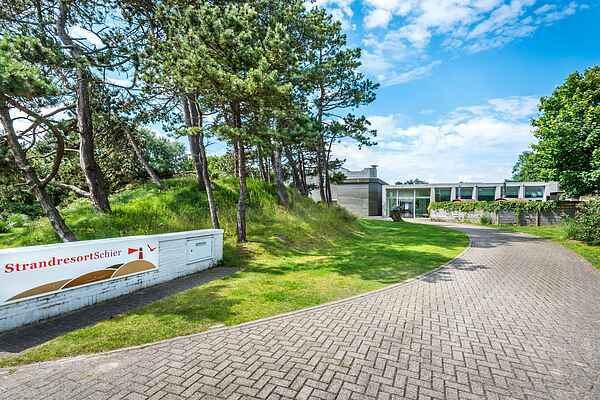 The resort is located on the beautiful island of Schiermonnikoog, just 400 metres from the beach and 300 metres from the village of Schiermonnikoog. This apartment consists of two floors. The living room features a flat screen TV and a comfortable double sofabed. In the open plan kitchen you'll find a microwave and a dishwasher. There are two bedrooms, one of which upstairs. Each bedroom features two single beds in a double set-up. The spacious bathroom features a shower and a toilet. Upstairs, you'll have a roof garden with garden furniture at your disposal. As a guest of Schier Beach Resort, you can make free use of the various wellness facilities, such as the indoor sauna for 2 people. There are also outdoor saunas for 4 people. These are barrel-shaped (the so-called barrel saunas) and wood-fired for an authentic spa experience. There is also an indoor swimming pool. Schiermonnikoog has very few cars on the island. Only residents are allowed to drive cars. Guests should park their car on Lauwersoog. Once you arrive on Schiermonnikoog, you can travel by bus, taxi or bicycle.